Jack Kerouac’s novel, On the Road, thinly fictionalizes his travel adventures across late-1940s America. I was, in a milder, tamer way, on the road myself this last week. Most of the way was by plane -- I flew from Gainesville to Atlanta, then Atlanta to Boston. And the train I hopped, from Boston out to Worcester, Massachusetts, I had a legitimate ticket for. 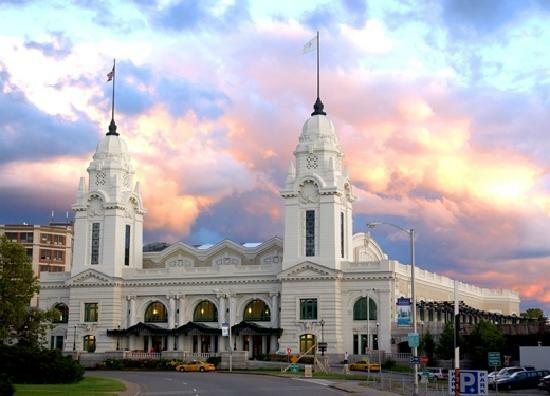 The train arrived in Worcester shortly after midnight, so I did have the chance to feel rather beatnik-hobo as I hoofed it three miles in the middle of the night from Worcester Union Station to the retreat center where I spent the week. (For more on that, click here.) Yes, there was a line of cabs at the station, and, sure, I had plenty of cash on hand to take one. But that didn't feel very adventurous. Or like much of a way to look for America along a three-mile stretch of Pleasant Street, Worcester, Massachusetts. Besides, I'm cheap. And could always use a little exercise. After the retreat was over, I was on the train back to Boston. The conductor came by to sell me my ticket and noticed the book I was reading. This is either the advantage, or the disadvantage, depending on how you look at it, of deciding not to get On the Road on my Kindle. "No, no. It was her mother that was Jack's sister," explained the conductor as he handed me my change. Then he he was gone on down the aisle. I returned to my book. The train, and Kerouac's prose, rambled on. When I got home I did some googling around. 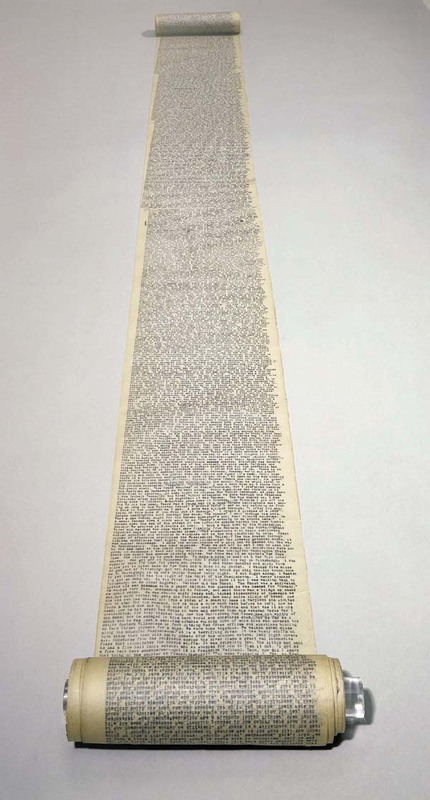 Jack Kerouac only had one sister, Caroline. And Caroline had one child, a son. No daughter. Maybe the conductor had meant a grandniece of a cousin of Kerouac or something. Or maybe he made it up entirely. Perhaps some part of his brain was remembering something Jackie Kennedy said shortly after JFK was elected in 1960: "I read everything from Colette to Kerouac." In any case, there's something about this Beatnik literary figure that people want to feel close to, somehow, in some way. Kerouac struggled with what he wanted this book to be for several years. Then, in April 1951, in a three-week burst, staying awake with Benzedrine, he wrote almost without pause. He didn’t even want to pause to change sheets of paper in his typewriter. So he cut tracing paper sheets to size and taped them together into one long hundred and twenty-foot scroll. And the thing flowed out of him, single-spaced, without margins or paragraph breaks. That was the first draft. Then there were six years of looking for a publisher and working with editors, and revising. (Previous blog entry has excerpts, and video of Kerouac reading from On the Road and Visions of Cody: click here). The original scroll of the first draft is now a revered artifact of American letters. In the picture, you see it stretched out like a road – a road of words, without even a paragraph break crack in its pavement, a road that beckons to us on that journey: journey to where? Where does Kerouac’s road want to take us? Kerouac’s quest is religious. 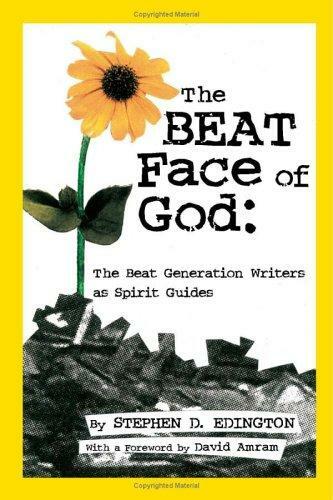 For him as for the beat generation generally, the journey is a spiritual one. The real road is the inward one, the road to find ourselves, to find authenticity. In America today there’s a claw hanging over our brains, which must be pushed aside else it will clutch and strangle our real selves. A tall, lanky fellow in a gallon hat stopped his car on the wrong side of the road and came over to us; he looked like a sheriff. We prepared our stories secretly. He took his time coming over. "You boys going to get somewhere, or just going?" We didn’t understand his question, and it was a damned good question. We have some dim inkling of where we want to get to – but it’s so vague to us that we can’t say whether we’re going somewhere or just going. We don’t know the answer, and we don’t even understand the question, but we understand just enough to know that somehow, it’s a very good question. The goodness of that very question – which we don’t understand, let alone know the answer – impels us forward – in search of an answer, maybe, or else just a question that we can feel we understand. In that quest, the idea of Dean Moriarty haunts Sal Paradise/Jack Kerouac: "I think of Dean Moriarty," is the last sentence of the book. This Dean Moriarty represents wildness, liberation, freedom, vitality. Moriarty – in real life Neal Cassady – actually was born on the road, “when his parents were passing through Salt Lake City, Utah in 1926” (On the Road, 3). Mother died when he was 10; raised by his alcoholic tinsmith father in Denver; much of his youth lived on the streets of skid row with his father, or in reform school for various thefts. Stealing cars was an early talent and habit. At 19, out of jail, he and first wife “Marylou” – the real life Luanne Henderson – moved to New York, where he and Kerouac met. 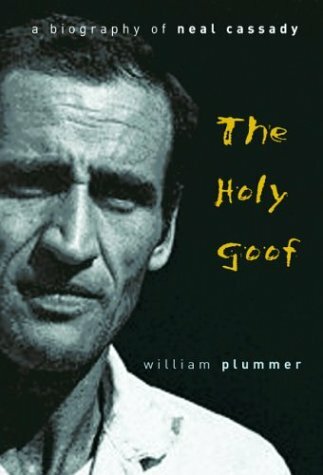 In real life, this Neal Cassady, with his crazy intensity of life, unstoppable energy, overwhelming charm, and savvy hustle, did only a little writing: published some poems and an autobiographical novel. Mostly, however, Neal Cassady was an artist whose medium was being. The pen, really, was too slow for him: Cassady was a live show. He was a muse, an inspiration, for Kerouac, for Allen Ginsberg, who writes about Cassady in “Howl,” the most famous Beat poem, which calls “N.C.” (Neal Cassady) the "secret hero of these poems." Cassady would go on to meet Ken Kesey, author of One Flew Over the Cuckoo’s Nest in 1962, and became one of the Merry Pranksters, a group that formed around Kesey. 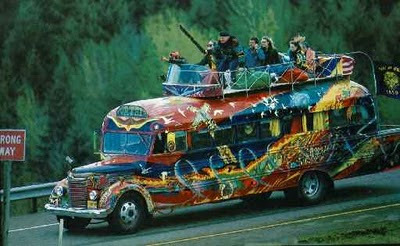 Kesey wrote about Cassady in the book Demon Box, calling him “Superman.” In 1964, Cassady was the main bus driver of a bus – the destination across its front simply saying, “Further” -- immortalized in Tom Wolfe’s book, The Electric Kool-Aid Acid Test. Hunter S. Thompson wrote about him in his book, Hell’s Angels. And in fact that was the point, and they all sat around looking at Dean with lowered and hating eyes, and he stood on the carpet in the middle of them and giggled – he just giggled. He made a little dance. . . .
and he’s given all of you a damned good time just being himself, and if that isn’t enough for you then send him to the firing squad, that’s apparently what you’re itching to do anyway. . . . Suddenly we see that this familiar, familiar voice of morality and reason, source of so much rage, is as filled with contradictions as Dean’s free-wheeling is. If you were any good you’d go back, but don’t you go back because she won’t have you. And the people we want are the ones we want to kill. but standing in front of everybody, ragged and broken and idiotic, right under the lightbulbs, his boney mad face covered with sweat and throbbing veins, saying, ‘yes, yes, yes,’ as though tremendous revelations were pouring into him all the time now, and I am convinced they were, and the others suspected as much and were frightened. He was BEAT – the root, the soul of Beatific. . . . There was a strange sense of maternal satisfaction in the air, for the girls were really looking at Dean the way a mother looks at the dearest and most errant child, and he with his sad thumb and all his revelations knew it well, and that was why he was able, in tick-tocking silence, to walk out of the apartment without a word, to wait for us downstairs as soon as we’d made up our minds about time. This was what we sensed about the ghost on the sidewalk. I looked out the window. He was alone in the doorway, digging the street. Bitterness, recriminations, advice, morality, sadness – everything was behind him, and ahead of him was the ragged and ecstatic joy of pure being. “The sooner he’s dead the better,” said Galatea, and she spoke officially for almost everyone in the room. Does Dean Moriarty Neal Cassady have the secret? Doesn’t he? Ah, what is this life? At the end of On the Road, Sal drives off with friends leaving Dean alone in the cold. Conventional morality says: Choose between living for yourself and caring about others. Or try somehow to hew a balance between these opposites. Conventional morality is surely wrong. Living for yourself and caring about others are not opposites. The greatest gift that you can give this world is the gift of presenting to it who you truly are – your most real and authentic self, following no script, creatively present to each moment, ready to surprise and be surprised. And that very thing is also your own deepest desire. I don’t know what to tell you about how to address the challenge presented to us in the figure of Dean Moriarity/Neal Cassady. After all, the point is that my guidance is beside the point. Don’t listen to the preachers – even if they dress in black and look scruffy. Listen to yourself. Ironically maybe, listen to himself is what Dean Moriarty fails to do. Impulses pour out of him, but is he even aware of them at any point before he is in the middle of what they compel him to do? He doesn’t so much have impulses as the impulses have him. Is that freedom? Is that calmly greeting the tiger of fear with a steadfast “hello, tiger,” presence? Or, instead of fleeing from the tiger into conformity and conventional morality, does Dean merely flee the opposite direction into excess? I believe that your true self emerges from neither repressing nor indulging. Attend to the impulses, the mad, wild desires. Don’t push them down or away; they are always offering you a teaching: listen carefully. Follow no formula, but a creative and loving and spontaneous wisdom. Slow down and maybe then see what this life is. And what to do with it? You could take it on the road every once in a while.